This past Saturday, hundreds of Tritons gathered in the gym to celebrate our 2018 Homecoming. 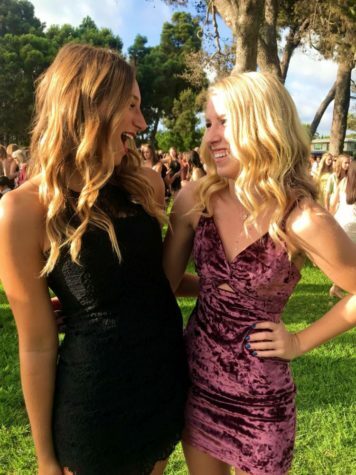 Being the first dance of the new school year, homecoming can put a lot of pressure on what to wear, and we all know it can be difficult for girls to make that tough decision. From left to right: Seniors Sophia Helm and Eryn Gill at Pines Park on Saturday afternoon. Red proved to be extremely popular for the 2018 homecoming, and many girls gather to show off their Triton pride at Pines Park. “I chose a red dress because I have been wanting to wear one for a while now,” said fellow senior Eryn Gill. 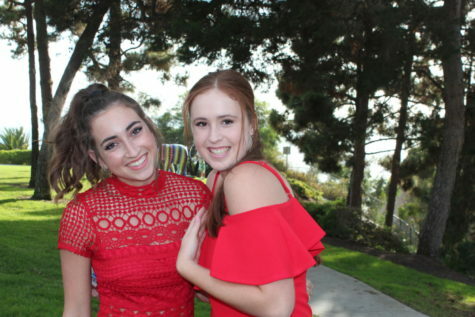 “I think red is a good color on me and show my personality well!” Gill and Helm were only two of the many girls dressed in red this homecoming, especially for the senior class. However red was not the only popular color at this year’s HoCo, as many girls were seen wearing white for their final homecoming dance. In years past, black has usually dominated homecoming as the most common color, but this year red and white really stole the show. Thats not to say that those were the only colors represented at this years homecoming, many other solids were shown off by senior girls. Seniors Daisy Frauenzimmer and Isabella Anderson enjoying the festivities at Pines Park. Isabella Anderson explained her reasoning behind her homecoming look stating, “I loved how it was velvet because it was so soft and comfortable to dance in.” Anderson adds that she wanted to choose pink because it is her favorite color, and that “most people wear red or black,” explaining that she wanted to be different than the norm for her final homecoming. Regardless of what was worn, Homecoming 2018 was a magical night for all those who attended. Being a senior, it’s important to make the most of your senior year and enjoy all the activities SCHS offers. Luckily for us seniors, this years homecoming really exceeded expectations, and will be a night I’m sure all of us can agree that we will never forget.